In a medium saucepan, heat the cream, milk, and crushed coffee beans to just under a boil. Remove from the heat and let stand at least 1 hour for the beans to infuse their flavor. In a medium bowl, whisk together the egg yolks and sugar. Pour the cream mixture into the egg yolks, whisking until well blended. Return this mixture to the saucepan and cook over medium heat, stirring constantly, until it thickens slightly, enough to coat the back of a wooden spoon. Strain the custard through a fine mesh sieve and chill. Freeze in an ice-cream maker following the manufacturer's instructions. When frozen but still soft, transfer the ice cream to a stainless-steel bowl and swirl in the chopped brittle with a spatula. Cover the ice cream tightly with plastic wrap and freeze. Garnish with the remaining shards of brittle, when serving, if you like. Line a baking sheet with kitchen parchment and spray the parchment with nonstick cooking spray or grease it lightly. In a medium heavy-based saucepan, combine the sugar and water. Heat over high heat, swirling the pot occasionally (don't stir it) for even color, until it turns light amber. Add the crushed espresso beans (don't worry if the sugar seems to foam), swirl them around in the caramel, and continue to cook until the caramel turns brown. Remove the pan from the heat. Carefully whisk in the butter and salt (the butter will sputter). Immediately pour the brittle onto the prepared baking sheet, quickly tilting the baking sheet to get the brittle to flow into a thin layer (be careful -- the brittle is very hot). As it cools and slows down, use a metal spatula to spread it into an even thinner layer. Let cool. Chop two-thirds of the cooled brittle into small pieces by sealing it in a plastic bag and smashing it with a mallet or rolling pin. Sift the crumbs in a strainer if you don't want the powder. 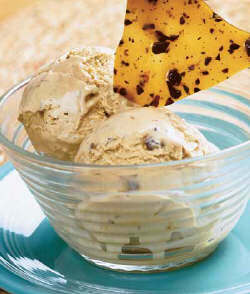 Break the remaining brittle into shards and use them to garnish bowls of the ice cream.